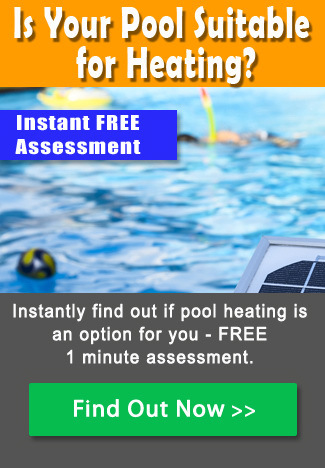 Electric heat pumps are currently only used by a small minority of Australian pool owners. But that’s changing – and with good reason. In fact, with very many good reasons. If you’d like to know why, read on. Easy, eh? So how come nobody thought of this before? Well, actually they did. Heat pumps were first developed back in the 1970’s. However, it has only been in very recent years that the technology has significantly evolved. Today’s heat pumps have a life-expectancy of around 7-10 years; produce a noise level so low that, at around 1 metre distance, they are no louder than your regular pool pump; and are driven by ozone-friendly systems. When compared to regular electric or gas pool heaters, the benefits are simple enough. Regular electric or gas heaters produce a bit less than 1 kw of heat for every 1 kw of energy consumed in the process. Electric heat pumps, however, produce anything from 3 to 6 kw of heat for every 1 kw of energy consumed. (This is known as the ‘coefficient of performance’, or COP – a heat pump that requires 1 kw energy to produce 5 kw of heat has a COP of 5.) Additionally, when compared to gas heaters, electric pool pumps cost around 80% less to run than LPG, and around 50% less than natural gas. Also, when compared to solar pool heating systems, electric heat pumps have significant advantages. For one thing, they have a much faster heat up time than solar. For another, sunshine isn’t required in order for the heat pump to warm your pool. They will continue to work even in ambient air temperatures as low as 7ᵒ C. And, they don’t require roof systems or panels or extensive additional pipe work. What Types of Heat Pump are Available? There are a number of different size heat pumps available. Domestic versions range in size and output power from 3.5 kw to between 30 and 40 kw. The right one for you will depend on the size of your pool, and how many months of the year you want to swim in it. 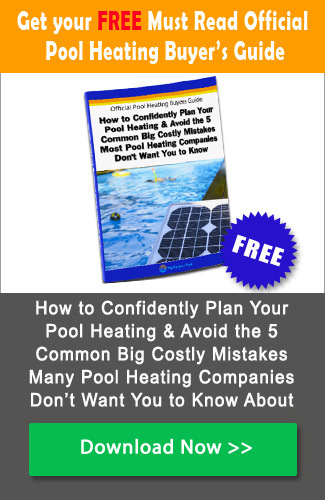 Equally, a lot will depend on whether your pool is covered – a covered pool requires a smaller heat pump to do the job. And, naturally, a lot depends on where you live. A pool in Hobart is going to require more effort to heat in the spring and autumn months than a pool in Darwin. Warm air is drawn in from the atmosphere via a fan into the heat pump system. It is then passed into an evaporator that contains a piping system filled with a refrigerant called R134a (note: R134a is NOT a CFC). Even though R134a is technically a refrigerant, it has a boiling point of -26ᵒ C. The warm air passing into the evaporator, therefore, instantly boils the refrigerant and turns it into a gas. The heated gas is then pumped by a compressor that effectively super-heats it before a heat exchanger then transfers the heat to the pool water that is, in the meantime, being pumped from the pool via the regular pool filter pump to and through the heat pump system. The heated pool water is then pumped back into the pool. Once the heat exchange occurs, the R134a refrigerant instantly cools and returns to its liquid state. And so the long day wears on. 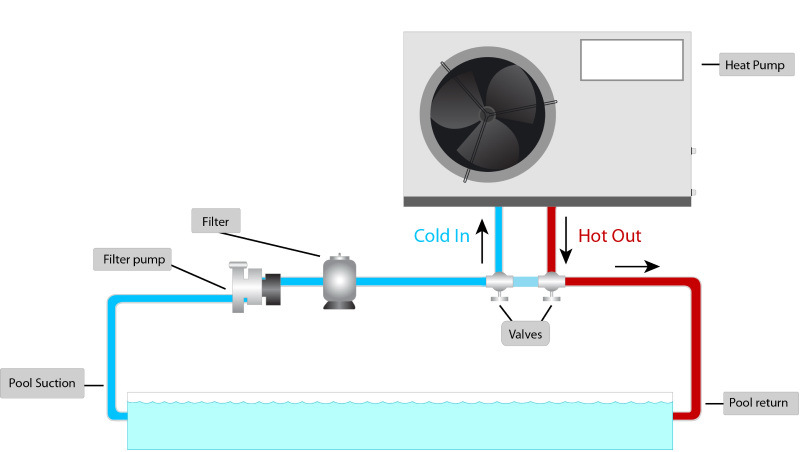 Heat pumps are thermostatically controlled, thereby allowing you to control the pool temperature. Depending on the type of heat pump you select, these controls can be either simple dial-type analogue devices or computerized digital devices. Other options include time settings that allow you to run the system during off-peak electrical tariff hours. Installation is fairly straightforward since, in terms of basic plumbing, the water simply flows from the pool to the regular filter pump, then out of the filter pump to a by-pass from where it proceeds into the heat pump’s inlet. After passing through, the water then exits via the heat pump’s outlet, flows back into the regular filter pump systems inlet piping, and thence back into the pool. 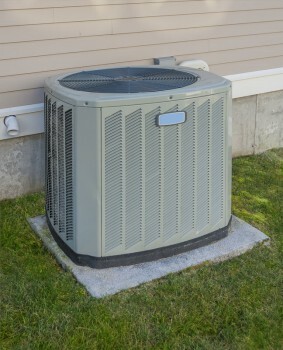 Heat Pumps can be installed both indoors and outdoors. For ease of plumbing (see below), and to avoid the necessity of digging trenches and running cables, the easiest option is to locate the heat pump close to your regular filter pump system. Indoor installation, however, does require proper thought being given to ensure there is sufficient ventilation and air flow – remember, the heat pump works by using a fan. Plumbing in a heat pump usually only requires 40mm pvc connections, and could be undertaken by anyone with basic plumbing skills and familiarity with pool systems and hardware. However, it is highly advisable to have a plumber or pool shop install the plumbing since many systems require, as part of their warranty conditions, that specific standards, bypass methods, flow meters, surface gradients and angles are included/adhered to as part of the installation process. As a rule, domestic swimming pools usually only require a single phase electrical installation. The electrical installation and wiring, though, should be undertaken by a licensed electrical contractor. Under Electrical Safety Regulations of 2002, it is illegal in all states for unlicensed individuals to perform electrical work on water equipment. How Much Do Heat Pumps Cost to Install? Installation of a heat pump, undertaken by a professional, generally costs in the region of $400-$500. 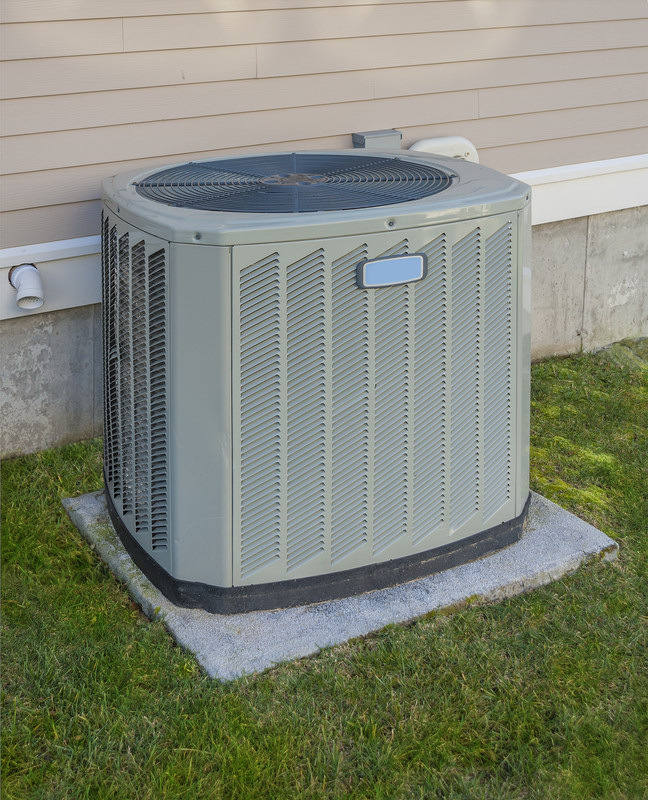 That having been said, the actual purchase of a heat pump is likely to set you back, depending on the size of your pool, anything from $2,800-$5,000. However, although electric pool pumps may be more expensive to purchase than regular electric or gas heaters, the fact that they are significantly more energy efficient means that their running costs are far lower. In addition, because heat pumps produce more energy than they consume, they are regarded by the Australian government as renewable energy sources. As such they can qualify for Renewable Energy Certificates (REC’s, also known as Small-Scale Technology Certificates or STC’s). The practical upshot of this is that owners of heat pumps can obtain a rebate on the purchase price from the government – although only if properly installed by a qualified and certified installer. Depending on where you live and market conditions, these rebates can be worth around $300-$500. You can claim either by completing the relevant forms from the Office of Renewable Energy Regulator or, more simply, by assigning your rights to claim an REC to an agent. For more information click here. Thanks for the comment. Someone should have been in touch with you already. If you still need help, please let us know. Hi, interested in a heat pump for a 4×7 pool. We are not wanting to heat to spa temps, just take the edge off. Also would like a quiet model. Someone will be in contact with you shortly. Thanks. Can you email me with some units and prices. my pool is 44m2. I am doing a new build and have a 10kw solar system ontop of my roof that I am wanting to draw power off on a timer once a day to run the electric heat pump. I am thinking of drawing off using 5kw of my 10kw system for a few hours. how many hours do u think the pool pump will come on for a day? (just a ball park figure considering it a north facing pool with no obstructions from the sun with a pool cover? what is the optimum pool temp for it to shut off (perfect temp for pool) at? what pump would you recommend? Need quote for heat pump, 32 sq m pool.